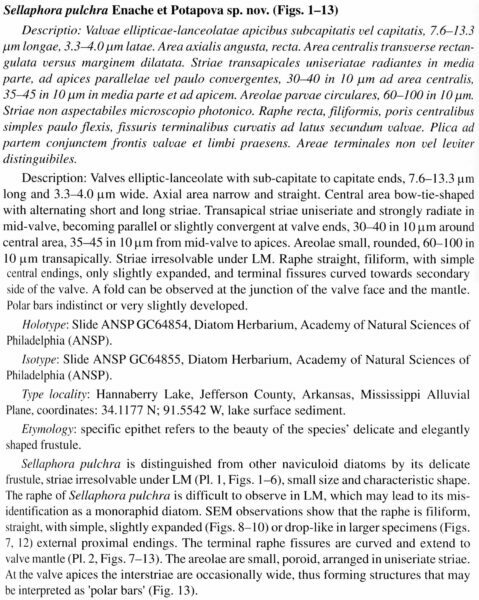 Valves are elliptic-lanceolate with sub-capitate to capitate ends. The axial area is narrow and straight. The central area is bow-tie shaped, bordered by alternating short and long striae. The striae are uniseriate and strongly radiate in mid-valve, becoming parallel or slightly convergent at the valve ends. 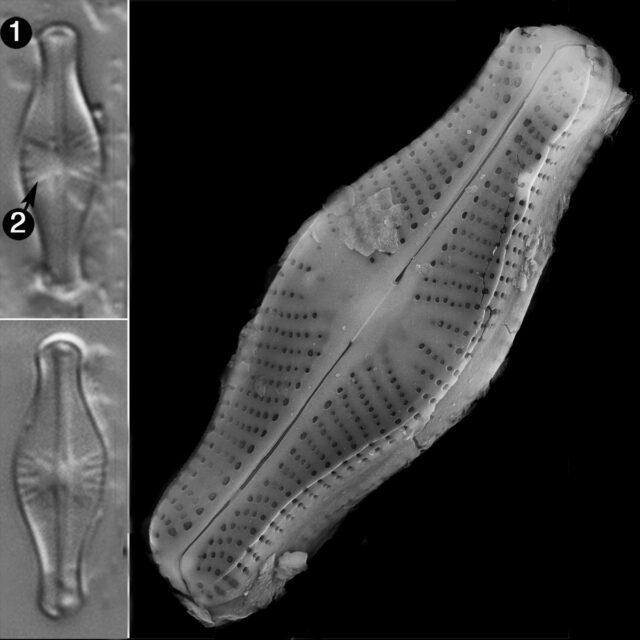 Striae are not resolvable under LM, with the exception of a few central striae that may be visible in some specimens. The areolae are small, rounded and number 60-100 in 10 µm. The raphe is straight and filiform, with simple proximal ends. The proximal ends are only slightly expanded; the terminal fissures are curved toward the secondary side of the valve. Polar bars are indistinct, or very slightly developed. Description: Valves elliptic-lanceolate with sub-capitate to capitate ends, 7.6-13.3 µm long and 3.3-4.0 µm wide. Axial area narrow and straight. Central area bow-tie-shaped with alternating short and long striae. Transapical striae uniseriate and strongly radiate in mid-valve, becoming parallel or slightly convergent at valve ends, 30-40 in 10 µm around central area, 35-45 in 10 µm from mid-valve to apices. Areolae small, rounded, 60-100 in 10 µm transapically. Striae irresolvable under LM. Raphe straight, filiform, with simple central endings, only slightly expanded, and terminal fissures curved towards secondary side of the valve. A fold can be observed at the junction of the valve face and the mantle. Polar bars indistinct or very slightly developed.